We are delighted to announce the opening of the first phase our new purpose built cattery, which is sited away from the kennel building, and has been designed with security and comfort in mind. 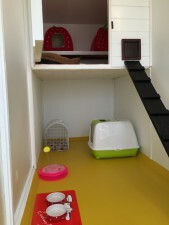 The individual cat cabins are well proportioned, and offer secluded and heated accommodation with raised sleeping areas for up to two cats from the same family sharing. We offer either an igloo style bed or a duvet lined kidney shaped bed, both with extra blankets if required and in addition, heat pads are available for very young or elderly infirm cats. 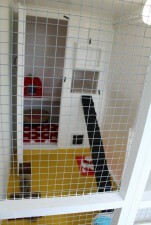 The generous exercise/play runs are fully equipped with enclosed litter trays (ensuring privacy), scratch poles, elevated seating areas with views, and various ‘boredom busting’ toys and amusements. An opaque sneeze barrier separates each run and acts as a screen preventing cats from seeing others. We have endeavored to offer a safe, secure, warm and stimulating environment for each cat whilst separated from its owner and its own territory whether for short or long term boarding. Cats are fed twice a day, breakfast and tea time or in accordance with the owner’s instructions and we stock wet and dry foods from the ‘Felix’ and Arden Grange range of cat foods. Alternatively, cat owners are welcome to supply their pet’s food for the duration of boarding if that would be preferred. If required, in your absence, medications will be given and essential pre-arranged veterinary appointments at Dalriada Veterinary Surgery, Lochgilphead met. Please advise us prior to arrival. Every cat being admitted to the cattery facility must have a current vaccine certificate issued by a veterinary surgeon. The primary course of vaccination must have been administered at least 3 weeks prior to entry into the cattery, and providing subsequent boosters are all administered without lapsing then no exclusion would apply. However, we regret that no cat can be admitted to our cattery without a fully valid vaccine certificate. We trust that owners will regularly worm and apply proprietary tick/flea repellents or have the vet approved collars on their cats. For advice about wormers and tick/flea repellents, please discuss with your vet. Should your cat become unwell whilst staying with us at Achnabreac, he will either be taken to Dalriada Veterinary Surgery in Lochgilphead or one of the veterinary surgeons will be asked to visit and any necessary treatment will be administered. We follow strictly any veterinary advice and treatment plans given. It is always advisable to check availability as early as possible to allow time to arrange for vaccinations if required and to avoid disappointment. We do not take bookings online – please telephone or call by. For those owners who experience difficulty with collecting their animals within our opening times we can collect and deliver – please discuss with us when booking. A single cat boarding will be charged at £10 per day, two cats boarding together will be charged at £18 per day. Please note for the purpose of boarding charges the cattery day runs 12 noon – 12 noon. 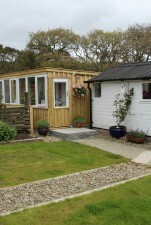 For example a cat coming in on Friday 9am and collected Sunday 6pm will be charged at £30 (3 days). Out of Hours Admissions/Collections Strictly by Prior Appointment Only. We are happy for prospective customers to visit our cattery so they can see firsthand the facilities offered – please just arrive anytime within opening hours, however, if possible avoiding first hour of morning opening.